We have been “traveling” for more than a month already, and yet I am sad to say that we have hardly done anything touristy at all! Mostly we have been visiting family and taking care of various “work” that has to be done every time we visit our home countries. (Renewing driver’s licenses, paperwork, etc). I have to admit that I have been getting pretty bored being at the house with Olivia all day and hardly going out. 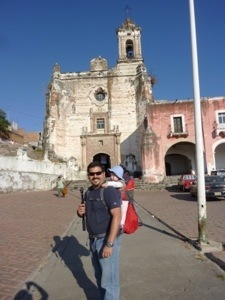 But finally last week we got the chance to take an afternoon off and we went to the neighboring city of Atlixco. Atlixco is on the other side of some mountains and has a nicer climate than Puebla, so it is famous for it’s farms and plants. 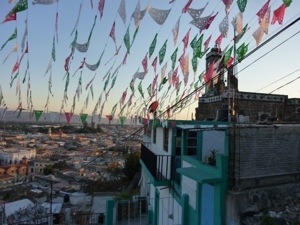 Most of the flowers sold in Puebla are grown in Atlixco. 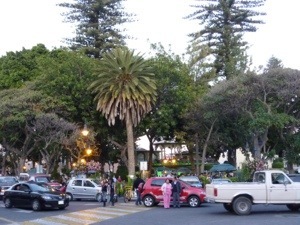 It also has a beautiful Zocalo (town square) filled with palm trees and small vendors selling balloons and plants. 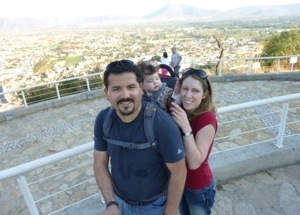 But we wanted to get a little more exercise and see some nice views, so we decided to climb the mountain to the chapel of San Miguel. There were no signs, so we asked several people for the best route to get to the top, since there were a lot of stairs going through winding neighborhoods. As always, everyone had a different opinion. This way will be longer but has better views, that way is easier to climb but “uglier”, the other way is difficult to climb (aka steps falling apart and lots of holes) but is shorter. We asked one person weather there were bathrooms at the top, and he said yes, but they are probably bad, so he actually offered to let me use the bathroom in his house! “Just close your eyes” he said. (Since he had dirty laundry everywhere) Even after marrying a Mexican and spending tons of time in Mexico, the hospitality of this country continues to amaze me. Halfway up the mountain there is an ex-convent, which we took the time to explore. Even though it is falling apart it has a certain mystical beauty about it, at least on the outside. The inside was beautiful too, but it had a lot of very graphic and gruesome statues and relics. 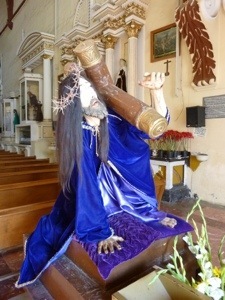 The first thing to greet you when you walk in is this statue of Jesus carrying the cross.
. There was also a life size statue of a saint lying in a coffin complete with very realistic looking hair. 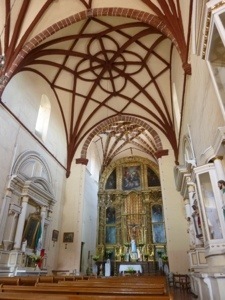 But if you can get past those things without feeling sick, the church is really very beautiful, especially the ceiling. From here we continued up the winding pathways until we reached what appears to be government owned land, complete with signs telling us about the native plants on animals. 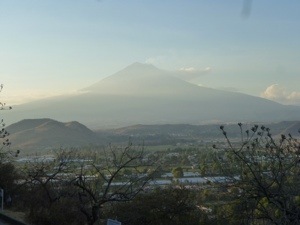 The views from the mountain side are fantastic, and from here you can really see the volcano Popocatépetl. We made a pit stop near the top of the mountain to give Olivia some food (potato-vegitable patties and cereal). The chapel at the top is very cute and well kept. 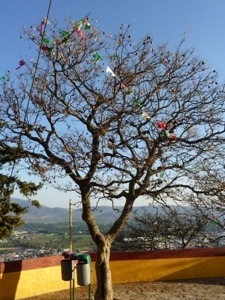 I also really liked the tree full of prayer flags. Being the adventurous people we are, we decided to pick our way down in, baby and all! On the way down we also had a nice view of the city as the sun was beginning to set. We had a great dinner at a restaurant in town – I had a Pueblan specialty called Pollo Huitlacoche which is chicken breast filled with the fungus which grows on ears of corn. It sounds strange but was soooo good, I highly recommend it. Even Olivia ate some!